Completion Level: Finished @ 140 Hours! Still being new to strategy SRPG’s at the time, we didn’t realize we were playing some of the all-time best exponents of the genre. Many strategy games we’d play in the future wouldn’t live up to the overall quality of Final Fantasy Tactics and Advance Wars. 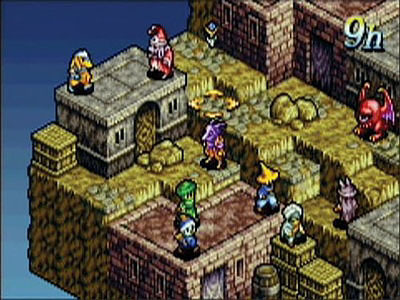 Final Fantasy Tactics Advance (FFTA) was recommended to us. It would take two months of heavy gaming to play through. The game is a relatively well known SRPG, and it brings about strong opinions. Usually ones having to do with its “kiddy” nature and the unwelcome addition of “judges”. The former catered to the younger GBA demographic. The latter was an opinion that, after playing through the game, we don’t share. Here a unit gets a red card for breaking the Judge’s law. Don’t mess with us judges. These horns aren’t just decorative, you know. 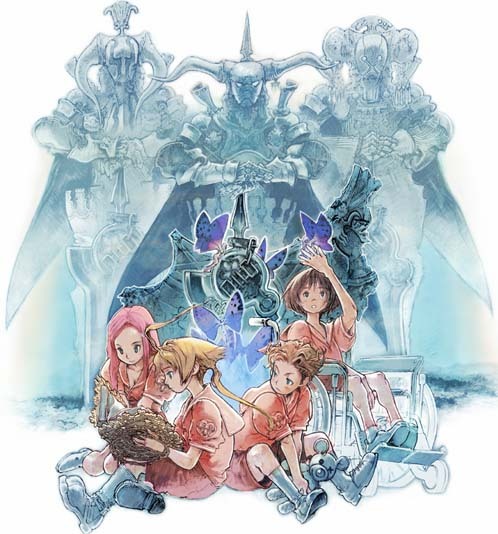 However you feel about FFTA judges, the game is well made and has an enduring legacy. Yasumi Matsuno was the man behind the Tactics Ogre strategy games at Quest. He took that experience with him to Square and made the Final Fantasy SRPGs. Much of what we take for granted in the genre is owed to him. This was the last strategy game he made for Square. 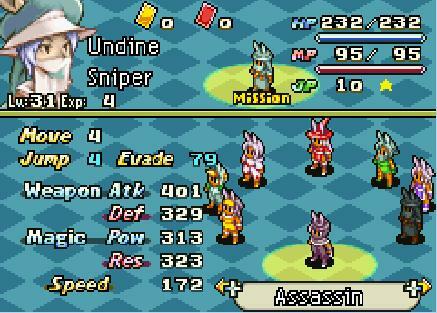 The structure of FFTA is the epitome of classic SRPG. The camera looks down upon non-rotating, 2D terrain of various types and implied elevations. You control a variety of warrior types from ranged to melee and see them through class growth of your choice. High quality visuals on all fronts. The environments are vibrant and clear. Terrain types, height differences and passable areas are all easy to discern. This foundation quality is sometimes inexplicably overlooked in other games. Ryoma Ito does a great job with the character designs and portraits. They’re some of the best you’re going to see in any SRPG—on any platform. Stylized, but not unpleasantly. Consistent and fun. Content. Lots of content. You can recruit and train multiple teams of varying races, classes and experience levels. 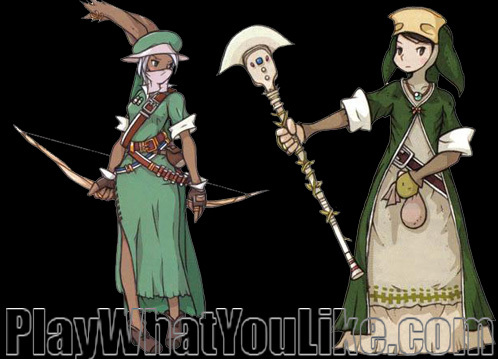 They can adventure in well-crafted, auto-generated battles in addition to the fine story offerings. This little game gives the illusion of a wider world. It adds to the feeling of self-determination and exploration. 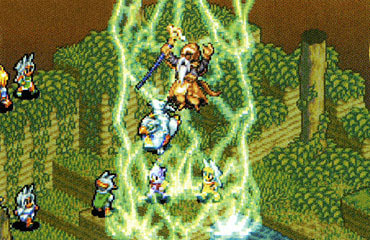 Square Enix squeezes a lot out of the little GBA in regards to the summons (large effects laden spells). They are visually interesting while not necessarily being revolutionary or bowling you over. The menus are streamlined and efficient. We surmise it was a specific goal of the developers. It keeps the gameplay moving at a good pace without wrestling with the Gameboy Advance’s controls, or bogging you down with unnecessary button presses. The music is fun and jaunty. It’s a pleasure to listen to despite the hardware limitations. Not totally epic sounding like Land of Legends or Brigandine. More all-around classic, and done well. We would like there to be a little more of it, but perhaps this is the result of playing it for so many hours. Many games, if not most, have less tracks. The premise is lighter. 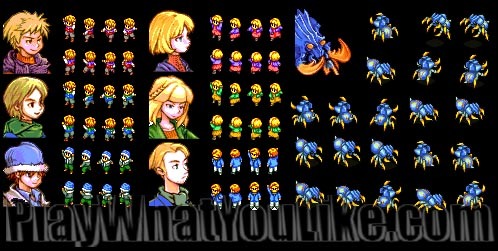 Not that it takes much to be lighter than the downer-ish Final Fantasy Tactics. Some might argue that it’s too light. We’re okay starting out in a middle school setting, and it soon travels to a serious fantasy world. Still, some may find it a poor partner to the wonderful and detailed game systems. 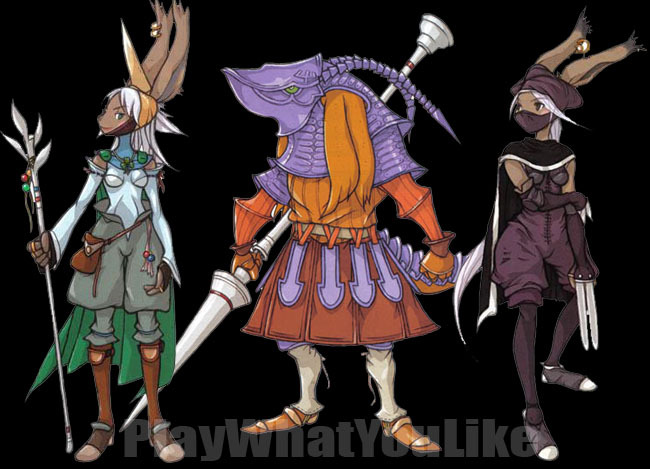 The Assassin class (right) is a welcome addition. Is it an appropriate “class” for middle school kids? No. But it’s fun. Equipping certain weapons gives you extra skills: That’s a good and interesting mechanic. However there are too many items overall. Finding just the right amount of items to include is challenging. And it’s hard to see the value of ones that don’t offer a special skill. The vertical variety of the combat maps is good but wanting. The percentage of flat maps is too high. (Great games like Rebelstar Tactical Command get away with it utilizing additional mechanics.) Although the environments are not true 3D, implied height differences add spice to battles. FFTA is so strong overall that this doesn’t bring it down much, but it could use a kick in this area. Here is some excellent 3D map layout, implemented in 2D. More of this would help. A few too many like this don’t help. There’s a lot of magic. That’s good. It’s split over many classes. That’s not quite as good. The more something is split, the less of it each piece-holder has. Additionally much of the magic spells are uninteresting. If you’re going to make it, make it useful; make it fun. 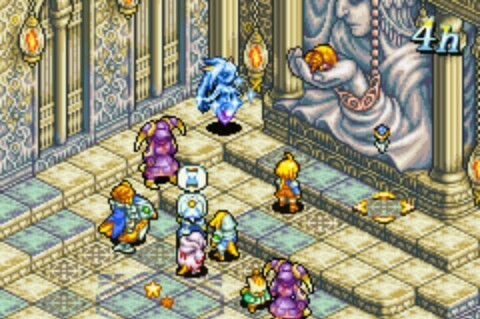 The blue mage (center) is unique to the final fantasy series. It learns an eclectic variety of spells—by being hit by them. It’s an enjoyable and challenging class. 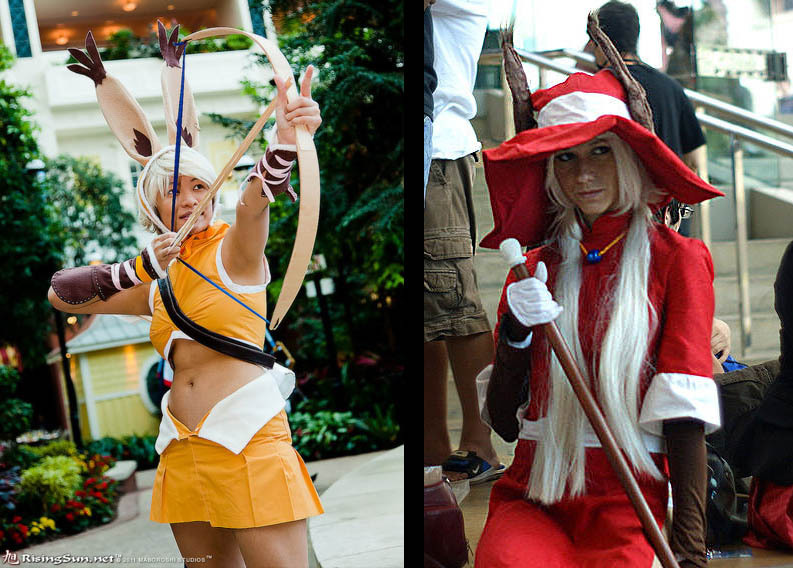 Three archer classes! Much appreciated by Play What You Like. The controversial subject of judges causes more than its share of impassioned arguments. We think they add value to the game as a whole. Much of the fun had in any video game comes through the prism of limitations. Should these poor, innocent little kids be afraid of those hulking, ominous, scary judges looming behind them? Judges decree certain limitations each battle like “no healing” or “no swords.” We find their rules strategically challenging. However something gets lost in translation (perhaps the fault of the localization team and not the developers). Some rules are worded in such a way as to leave them vague. 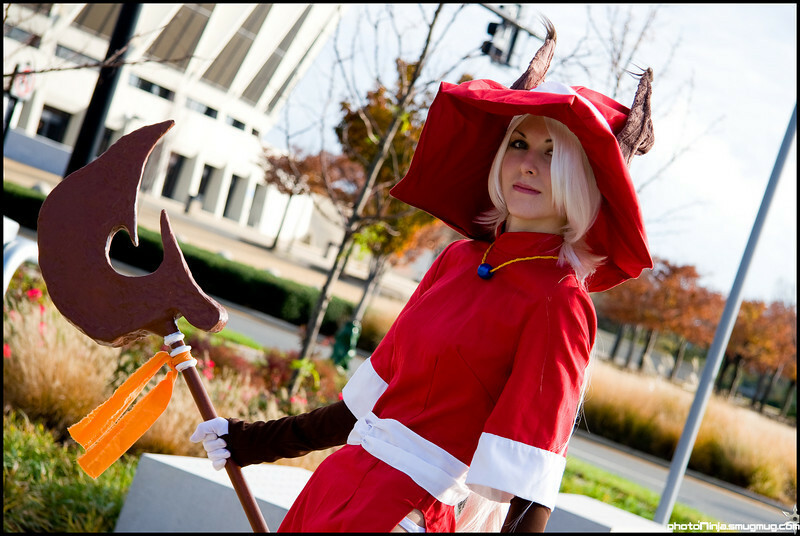 A judge might say, “No white magic.” Does that mean no spells from white mages? No “good” magic spells? No healing spells? 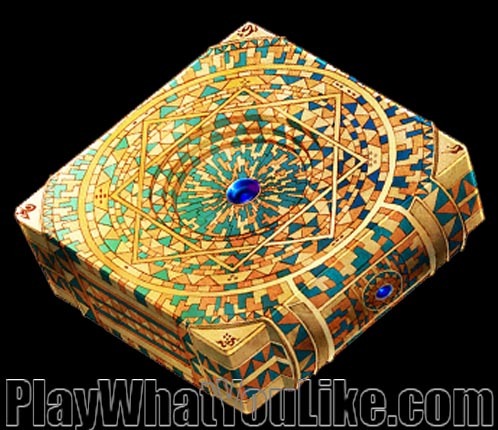 What about healing items? It’s frustrating and not hard to inadvertently run afoul of unclear rules and pay the price. All because you aren’t sure whether an action qualifies as prohibited. We think the idea has potential, but the mechanic needs more clear implementation. Moogles! 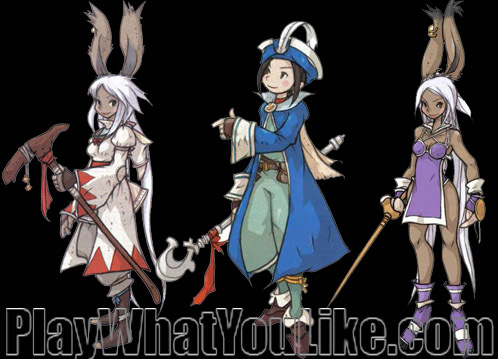 Moogles? It seems some Japanese are obsessed with these diminutive creatures. 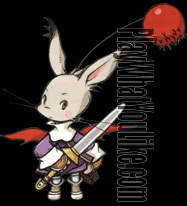 Moogles are a race of bunny like beings with human intelligence. They fight along side of you, all 3 feet of them. Quite frankly we’ve never seen their appeal, especially in a world of combat such as this. To us they break credulity. 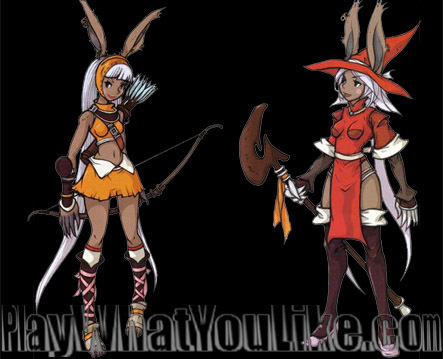 Note the moogle on the left. Difficulty level. It’s too easy, even with the limitations imposed by judges. Even including recruited newbies added to the ranks. We didn’t lose a single battle the entire game with the exception of a couple inadvertent Judge law breaks. We’re good, but that good? More challenge needed. The non-summon special effects. 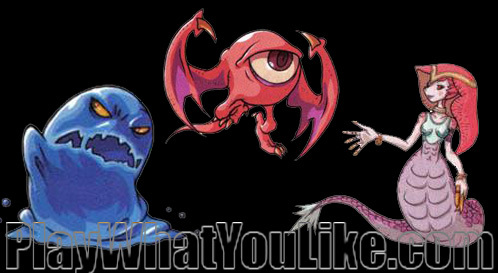 We know it is GBA. We’re familiar with what the platform can do. You can do better Square. The subplots consume much of the storytelling: Since the primary quest of the main character is not-so-fun, the subplots need to take up the story satisfaction gap (like the sub quests did in Suikoden Tactics). 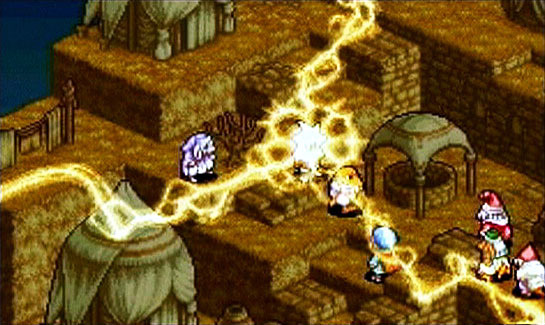 However FFTA’s aren’t resolved sufficiently to give the player the fulfillment earned. 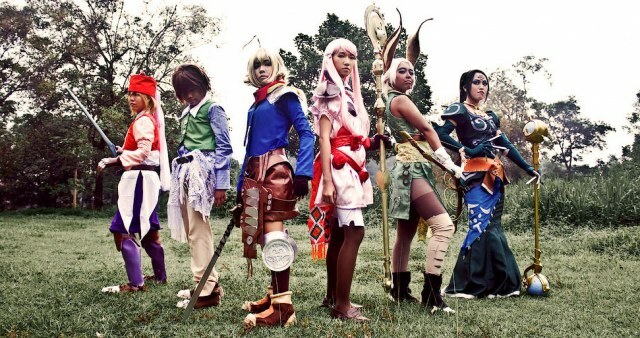 As the player you’re generally happy to be transported into this different world of clans and combat. That’s why you’re playing the game. However the lead character is a downer who wants nothing more than to return to the “real world.” Boooring. The worse part about being an evil queen are the strange looks you get when trying to ride the bus. Talk about not being able to get behind the the plot. Every battle isn’t to save the world from some great evil, it’s to end the adventure of our reluctant hero. Worse, we’re forced to fight against another person transported from the real world who just wants to stay. Sheesh, we’re with her. We’d think those who actively seek out this game relate more with the person who wants to stay rather than our uncertain “hero.” It’s no wonder we dragged out playing this game a little bit. We enjoy it, and in order to play it longer, don’t want the main hero to succeed. Talk about the wrong motivation to instill into your audience. 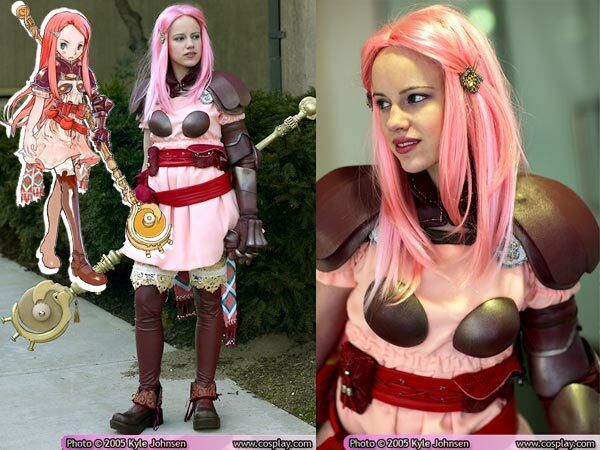 You know you have “made it” as a character when you get cosplayed. 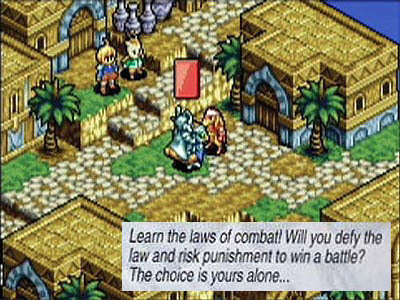 FFTA was easily one of the very best SRPGs on the GBA. 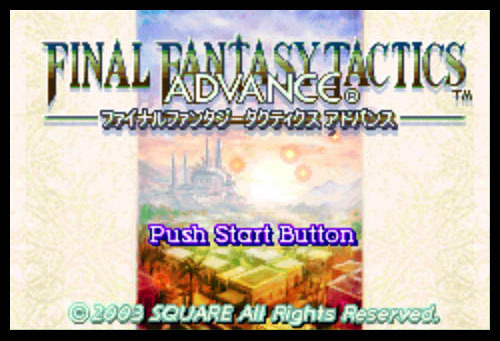 It did a good job of streamlining the controls, battle mechanics and graphics for a portable platform. Honestly, this engine and all its supporting features could have been the foundation for half a dozen fun strategy games. 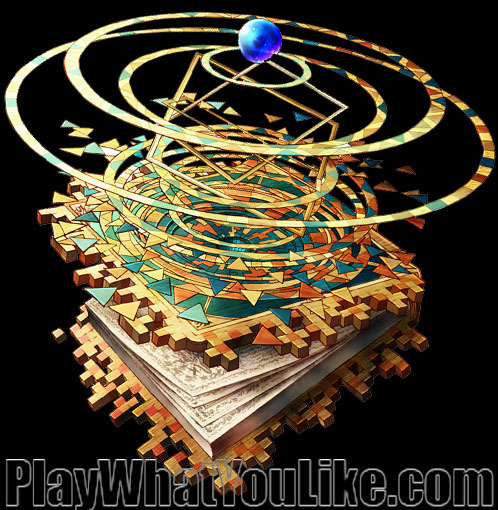 Games with more mature themes, licensed properties, or science fiction settings. 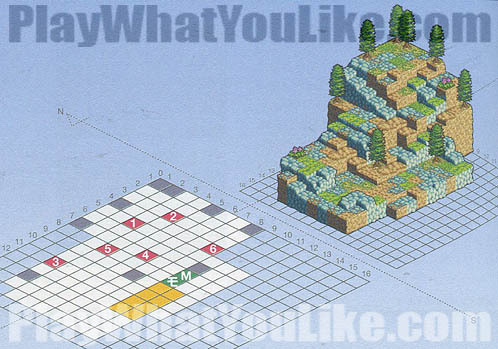 It could have been the go-to game construction engine of the GBA for strategy games. Sadly the technology was not used this way. Regarding the “hero,” one guy on youtube who posted movies of his play-through noted that the hero was “a jerk who wanted to ruin everyone’s fun.” We get you. So that’s one of the hurdles you’ll have to overcome to fully enjoy this game. The game is so good that this isn’t too hard, especially if you like playing SRPG’s. Another obstacle for some, the judges, we did not feel were an obstacle at all, but rather a strategy enhancement. You may disagree, but even so it will not shipwreck your playing experience. There are too many other fun factors. FFTA will leave you feeling better than when you started. That may sound like too obvious a point to mention, but believe us, some video game story lines leave you feeling a little depressed. FFTA’s action is good, the gameplay is varied, and the strategies are many. If you want them (and apparently we did), there are many, many hours of solid tactical action to be had. Addendum January 2016: We polished and edited the text. 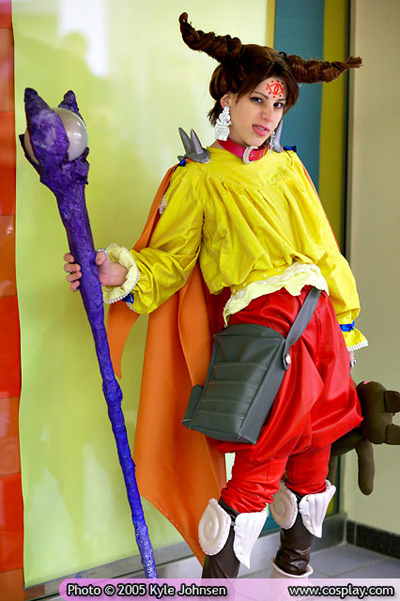 We also added a number of new cosplay pictures and the painting at the end. Thank you for this in-depth analysis of this classic game; I haven’t had time to play many of these older games yet but you hit upon an important point that the game engines are sometimes hidden by being tied to specific game rather than developed for use by others. Thanks for checking this one out DhyvD. It is good to know others out there appreciate Matsuno classics like this one. Your comment brought this analysis to our attention again, and we thought it needed a little bit more. So we added a bunch of pictures and polished the points (January 2016). Yes, about this engine, perhaps Square thought it too good to sell, and perhaps figured they would be doing more SRPGs in the future. 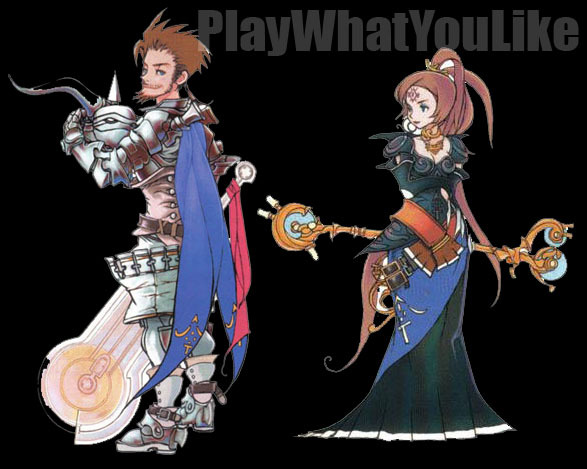 We wonder how much of this engine was ported over to the DS for Final Fantasy Tactics A2.